It isn’t late that we saw the unveil ceremony of Cadillac CTS Sedan, that Cadillac is all set to bring the upgraded Cadillac CTS V Coupe 2015. Limited to just 500 models this new release portrays company’s intentions to takeover customers of companies like BMW and Audi. Maybe this is why they are offering more power at a price less than its competitors. 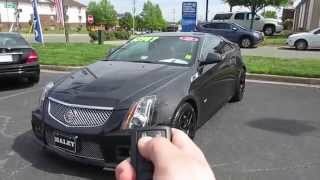 Let us have a look at the Cadillac CTS V Coupe 2015 review to find out how far the model deserves the badge. The interior of Cadillac CTS V Coupe 2015 comes in Ebony with red stitching adding to contrast accompanied by Midnight Sapele wood trim. We presume that this might have reminded many of you the Black Diamond Edition but form this time, this limited edition of 00 models will bring this look as standard with it. Apart from this company also provides an option of sunroof for those who need fresh air inside this enlightening cabin at an extra cost of $700. Moving back to the cabin, we have multifunction mounted and microfiber suede-wrapped steering wheel. The same essence of work also can be noted over the shift knob and metal pedals. Apart from these, what we found most interesting is the mounted Recaro performance seats for driver and passenger making the entire interior of Cadillac CTS V Coupe 2015 look sportingly gorgeous. 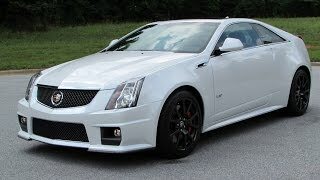 Looking at the exterior of Cadillac CTS V Coupe 2015 you might not find much changes as you did in interior but yes keeping the beauty isn’t a wrong idea. Let it be the lamps in front or rear, or the wheels it all gets carried from the standard model. Now question arises; what makes this limited edition ‘Limited’? So the reply to this is that wheels now come with Satin Graphite finish and come mounted with contrasting red brake calipers. Apart from this the exterior color of this limited model is limited to three shades only, out of which Crystal White and Phantom Gray come without any extra cost, however you’ll have to shed $995 to get the third one which Black Diamond. In all the exterior of Cadillac CTS V Coupe 2015 is all about what was created in past; however we still find it attractive and aggressive with the sleek body featuring muscular lines. Beneath the hood of Cadillac CTS V Coupe 2015 you’ll have a 6.2 Liter V8 engine cranking total output of 556 hp and peak torque of 747 nm paired to either six-speed manual or Hydra Matic six-speed automatic transmission. With this power rolling its wheels the top speed of Cadillac CTS V Coupe 2015 can touch the mark of 180 mph and can sprint from 0-60 mph in 4.0 seconds only.